The 2016 Honda Civic has been completely redesigned. The beautiful sedan is quicker, more fuel-efficient, and roomier, and successfully balances practicality and sportiness. A sedan comes to market first, with a coupe, 5-door hatch and high-performance variants to follow. The new Civic continues to offer impressive value, while giving buyers uplevel tech and convenience features not available in other compact sedans. 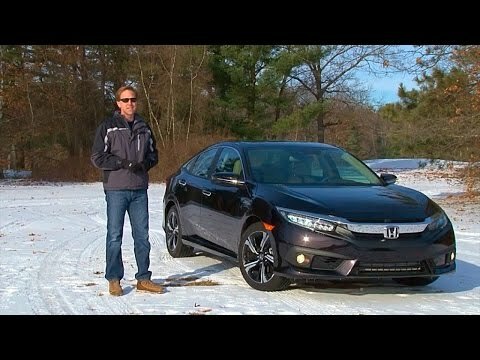 Honda Civic is a great car for the price. I have the base model which comes with a great stereo system with Bluetooth capabilities so I can hook up my iPod or my phone for music. It also has a backup camera which you can set to different levels and width of view. I didn't think I would like it, but it really helps especially when backing into somewhat tight parking spaces. I also like the hands free phone system that allows me to answer calls and mutes the music at the same time. The a/c and heater are great, you set the temp and it does it is thing pretty much. I live in Florida, so the heater is not that big of a deal, but I do like warm air on my feet at night or early in the morning. My only major complaint is that I wish it had a rear window wiper system. The back window is hard to see out of during a rain shower and early in the morning. Otherwise, the gas mileage is great, I get anywhere from 32 to 40 mpg, once even got 50 from highway driving. All in all a pretty nice car for the price. It has great fuel economy! My car runs very good on gas and is also very cheap to fill a full tank. Not only is the interior beautiful, but it feels super comfy once inside! There are many features I love. For example, you can play music through your Charger with no problem. The drivetrain is a front wheel drive and also has a seating of 5 people! Unfortunately, there are no heated seats for the winter and at times there are transmission failures. Sometimes there might also be air conditioner problems and a cracked engine block. The reliability of the car is an 3/5 stars in my opinion. You have great savings when it comes to purchasing this vehicle! Concerning the comfort, it is comfortable to be a daily driver in this car. There are high grade cabins and plentiful cargo space. I love this car because the braking power is strong, steering boasts excellent feedback, and the riding quality is excellent! I definitely recommend this lovely vehicle! Great looking, reliable car with great safety features. Love almost everything about the car. I've gotten compliments on the car's appearance, and one person even mistook it for a high end brand. Minor quibbles: a) in addition to a rear and side camera, I would've liked an audio alarm for unsafe lane changes and reversing, like the Mazda cars; b) I don't care for the third brake light flushed up against the rear windshield as you can't clean the entire inner surface of the windshield; c) electronic access and engine start are great features, however, sometimes the software glitches and then certain functions don't work such as adjusting the passenger window and the moonroof. I found that to overcome the glitch, one needs to lock/unlock the car with the second key fob. However, the engine starts up every time, unlike my experience with a Nissan car rental, where the key fob is not recognized at all by the car almost half the time. Honda (American Honda Motor Co.) is recalling certain model year 2016 Civic vehicles manufactured September 22, 2015, to February 3, 2016 and equipped with 2.0L engines. The affected vehicles have engines with piston assemblies that may have been manufactured without a piston wrist pin circlip or with an incorrectly installed piston wrist pin circlip. If a circlip is missing or incorrectly installed, the piston wrist pin may not be secure and may drift and damage the engine cylinder causing the engine to seize, and increasing the risk of a crash or a fire. Honda will notify owners, and dealers will inspect and replace the piston assemblies and damaged engine components, as necessary, free of charge. Parts are expected to be available in the Summer of 2016. Owners were mailed an interim notification beginning March 31, 2016, and will be mailed a second notice when parts are available. Owners may contact Honda customer service at 1-888-234-2138. Honda's number for this recall is JX9. Honda will notify owners, and dealers will inspect both the taillight assemblies, replacing them as necessary, free of charge. The recall began on August 31, 2016. Owners may contact Honda customer service at 1-888-234-2138. Honda's number for this recall is KB8.